Hand grind your own fresh pepper and salt! 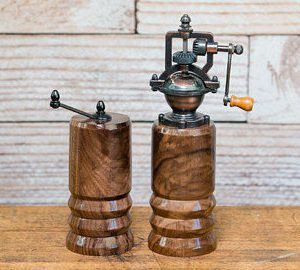 These grinders are made from Manitoba Maple or Box Elder Maple. Hand grind your own fresh pepper and salt! 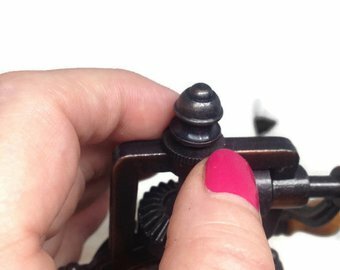 Our grinders have an antique style mechanism. I hand turn each grinder. These grinders are made from Manitoba Maple or Box Elder Maple. The interior of the grinders are coated with a food friendly mineral oil. The outside is coated multiple times with shellac to enhance the beauty of the wood. A maple tray is included to complete the pepper and salt set. As this piece is one of kind because of the character of the wood, the one you receive will be the one you see pictured here. Each piece is individually done. We include operating instructions with each grinder. Be the first to review “Pepper & Salt Grinder with Tray – Manitoba Maple or Box Elder Maple” Click here to cancel reply.